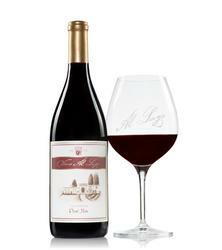 A bouquet of red fruit: freshly-harvested cherries, macerated strawberries, and a hint of red currants. Intensely bright cherry flavors with secondary notes of steeped winter spices. The combination of red fruit, high acid, and mild tannins make this a great example of a bright, well-balanced Pinot Noir. Fermentation: Fermented in small lots and hand-punched daily down.